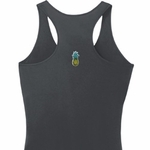 A ladies racerback featuring a pineapple patch on the back. Made with a blend of cotton/poly. Available in sizes Small through 2XL. Machine wash cold with like colors; dry low heat.